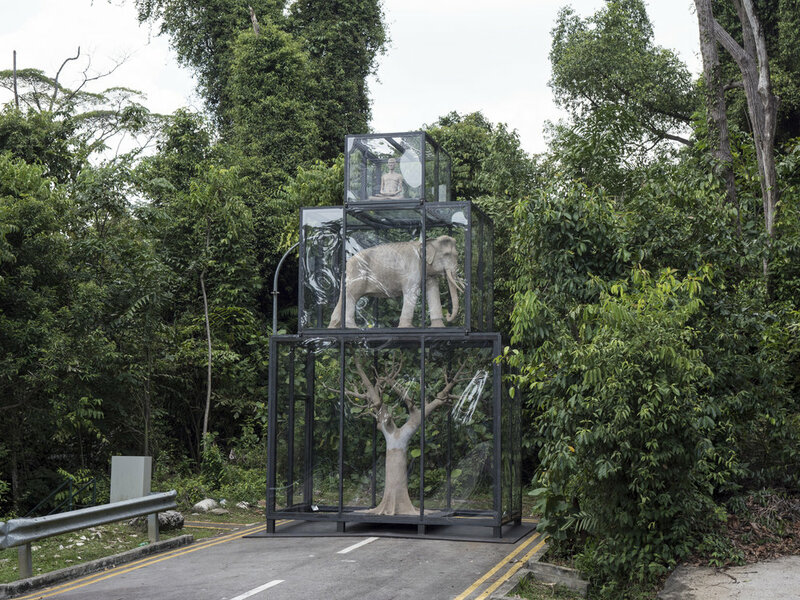 Consisting of three papier-mâché sculptures in transparent cases stacked atop each other, The Ground occupies an imposing height of eight meters. The man in meditation reflects Kamin Lertchaiprasert himself, accompanied by a life-sized elephant and tree with bare branches – created purely using the artist’s personal paper waste, amassed over more than 18 years. The Ground speaks of interdependence between man and nature, as excessive consumption disrupts natural order and contributes to hollowed human existence. Crucially, the work encourages reflection on individual habits and actions that result in less-than-ideal consequences for ourselves. Devoted to his Buddhist beliefs, Kamin views art as a ritualistic and meditative practice allowing for better understanding of the self and wider environment. Kamin established the land foundation with artist, Rirkrit Tiravanija, using rice fields as sites for art and architectural projects. His recent exhibitions include The Timeless Present Moment (2017) at the MAAIM Contemporary Art Museum, Thailand and Problem-Wisdom: Thai Art in the 1990s (2017) at the Queensland Art Gallery, Australia.